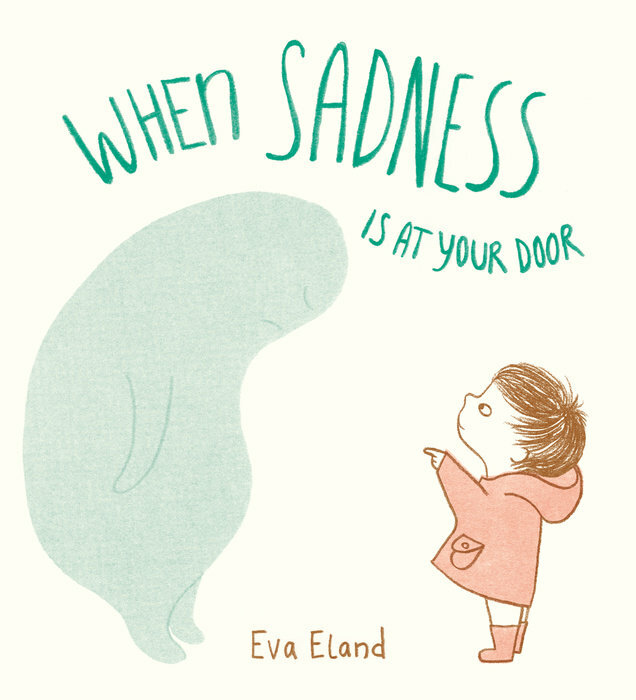 FTC disclosure: I received a free advanced copy of the book When Sadness Is at Your Door by Eva Eland, in exchange for a fair and honest review. You don't *really* have to stay up all night--that's just what I call my 5-star rating. Eva Eland has written and illustrated a great lesson about empathy in this picture book, where Sadness comes like an uninvited guest, a clingy entity that won't leave you alone. Sadness is represented by a big, blue, transparent blob towering over the child that represents the reader. Sweet, simple crayon-like illustrations show "you" trying to cope with Sadness, through understanding, empathy, and acceptance. The simple design of the main child character can allow anyone to put themselves in their place. No matter the reason (or lack of reason) for sadness appearing at our doorsteps, no matter the age of the reader, When Sadness Is at Your Door is an excellent introduction to emotional intelligence, depression, and feelings. For such a short book, it boils a complex topic down to its essence and serves it to us like a thick, comforting hot cocoa, so that we'll know that it's fine for Sadness to come and stay awhile, that it will come and go, and how to be OK with it. The endpapers are also lovely and themselves tell a few little stories. Make sure to look at both the front and the back ones. You can find more about the author and illustrator at evaeland.com and follow her on Twitter and Instagram at @evaeland. The description marked "About this book" were provided by the publisher. I no longer post links to sites where the books can be purchased on major online bookstores, and I do not receive income from any links you click from this website. You can find purchase/affiliate links to this book on the publisher's page, but I highly recommend supporting your local independent bookstore with your purchase. Don't have a local bookshop? Did you know a lot of independent bookstores can ship books to you in just a few days? Check out https://www.indiebound.org to find your closest indie, or check out my favorites Once Upon a Time and Brain Lair Bookstore. Or look up http://www.worldcat.org to find a local library that might have the title available to borrow. If you would like to support this blog, please leave a comment, share the link to this post on your social media, or reach out to me at readnowsleeplater at gmail dot com.